The last month has seen a huge selection of new products available from VioVet. Whether you have a dog, cat, horse or small furry, there is something new which is sure to appeal. 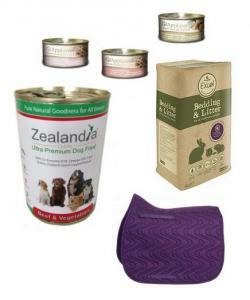 Our cat food range has been extended with the release of senior wet food from Applaws, while the dog market isn't forgotton with a range of wet food from Zealandia. Our horse equipment range has seen many new additions from the Hy brands, and small animals have not been forgotten due to the toys, bedding and bowls which have been added to expand the catalogue. Applaws have a wide range of pet food, each of which has been created to suit the nutritional needs of the animal. They have both wet and dry selections and are happy to boast that all the contents of each and every meal are 100% natural. They don't add any cheap fillers just to bulk it up, or additives that are totally unnecessary, just the goodness that your pet needs in their diet. Applaws have now brought out a range of senior cat food which completes their range for life stages from kitten up to senior cat. As cats grow from kittens to adults, and on to mature cats, their bodies change, and at the same time could do with some tailored support in their diet. Applaws have made this possible by using ingredients which bring benefits to the cat's bowl. Tuna with Salmon, Tuna with Mussels and Tuna with Sardines are the chosen varieties, each of which have been served in a light jelly, making the food much more palatable and easily digestible for ageing tummies. Each meal contains vitamins and minerals which are known to help support circulation, mobility, eyesight, skin & coat condition and heart health, all of which can require support as the cat reaches its later, less mobile years. Zealandia are a relatively new company in the UK. They have a goal of bringing in high quality pet foods all the way from New Zealand. New Zealand have long been known for exporting premium, healthy meat which is fit for human consumption and can provide flavour and nutrition which can satisfy a dog's need for biologically correct foods and treats. VioVet have stocked the Zealandia range of air dried dog treats for some time now, so know how popular they are with dogs and their owners. This is why the new range of Zealandia Ultra Premium dog food brings excitement. Now our customers and their dogs have the chance to enjoy complete meals which contain the high quality ingredients that Zealandia offers. There are 3 recipes available, each of which contains a quality meat source with added supplements that give support to various areas of your dog's health. There are no fillers, preservatives, artificial colours or flavourings added, and no unnecessary additives. Beef & Vegetables, Chicken & Vegetables and Lamb & Vegetables are the highly palatable choices, and New Zealand Green-Lipped Mussle, Omega 3 & 6 oils and Coenzyme Q10 are the supplements which have been added to every recipe, providing support for brain & heart function, circulation, skin & coat health and joint conditioning. Saddle pads are generally there to provide comfort to your horse and absorb sweat during riding, but there is no reason why they should be limited to just being a functional item. There is no shortage of pads available, but many could be seen as a bit plain for those that want to maintain quality and style when out riding. HySPEED have created the Pattern All Purpose Saddle Pad which is made from a durable soft cloth that provides a great fit, and is made into 4 different designs to suit any rider's style. The brightly coloured pads are available in Grape Swirl, Navy Stripe, Raspberry Circle or Tango Red Hearts designs. There is more to choosing bedding for your small pet than just going to buy the first bag of hay that you see. Every type is different and many have advantages which make them a better choice for both you and your little pet. You should consider the problems which could occur from having a poor quality of bedding; these can include the risk of becoming infested with parasites and not being able to prevent odours. The Burgess Excel range of small animal products have produced Bedding & Litter, which has been made to fulfil the various needs of small animals. It is made up from natural straw which is compressed into pellets which provide a 10 times more absorbent product than whole straw and shavings. The natural straw pellets reduce parasite breeding and provide rapid absorption, keeping your environment odour free and requiring less litter changes, saving you in waste and money.